Whether you burn wood in a fireplace, stove or furnace, good quality firewood is the key to convenience, efficiency and safety. Wet wood and pieces that are not the right size and shape for your wood burner can be frustrating, burn inefficiently and deposit creosote that can fuel a dangerous chimney fire. Good planning, seasoning and storage of the firewood supply are essential to successful wood burning. The first challenge in buying firewood is to measure quantity so you can compare prices. The cord is the standard unit of measurement for firewood. A cord measures 4 x 4 x 8 feet. Some people insist that wood must only be sold in 4 x 4 x 8 foot units, or full cords. But this is impractical because almost no one burns four foot firewood. As a result, many dealers sell fractions of cords, often called “face cords”, “stove cords” or “furnace cords”, which are piles of wood 4 feet high and 8 feet long and as wide as the length of the individual pieces, usually between 12 and 20 inches. The price of firewood sold in fractions of cords can be compared by calculating the volume of wood sold as a unit and comparing its cost per full cord. The table below gives some examples of how a simple calculation can be used to compare firewood prices. Regardless of the length of the pieces or the terms used to describe the units of firewood being sold, always convert to a volume measurement so you can compare prices accurately. The table at the right shows four different measurements of firewood pieces and gives some sample prices. All four options are converted to a price per full 4 x 4 x 8 foot cord by dividing 48 by the average piece length and multiplying that result by the price per unit. In the example given for pieces 12 inches in length the calculation is: 48 ÷ 12 = 4 x 65 = $260. Note that, as with many other products, the cheapest price isn't necessarily the best deal. Firewood that is perfect for your firebox in both piece length, thickness and dryness may be worth a little more to you. 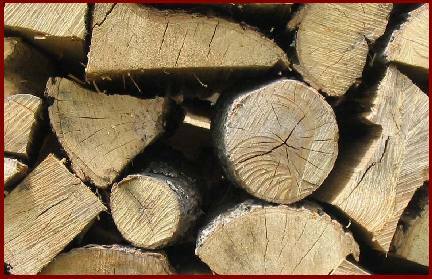 Ask friends and neighbours who burn wood for recommendations on reliable suppliers. Shop around and select the dealer who seems most reliable and comes with the best recommendations. Do not order wood by phone. Go to the storage area to inspect the wood and take a tape measure to check piece length and pile size. Look for wood that is clean. Sand and mud on firewood makes it less desirable. Make sure the pieces are split small enough for your appliance; you don't want to have to re-split it all. Do not buy randomly piled wood. Only stacked cords can be counted. Either measure the piled wood before delivery or stack it (or have it stacked) at home before paying so you can measure it and confirm that you get the volume you pay for. If possible, get the wood in spring and stack it in your own yard so you can control the seasoning process. What are the best tree species for firewood? All wood is chemically similar, regardless of species. It is mostly the density and moisture content that influence its behaviour in the fire and its value as firewood. Dense hardwoods like maple and oak have a higher energy content per cord and so release more heat per firebox load. They also produce long-lasting fires and coal beds. Softer woods like birch, pine, spruce and poplar are less dense, burn faster and do not produce a long-lasting coal bed when burned. Traditionally, hardwoods were the preferred firewood, especially in central and eastern North America, but softer woods make excellent fuel for spring and fall use. Those who heat with wood in the coldest parts of North America have only softwoods like spruce and pine and light deciduous trees like birch and aspen to burn and they still manage to stay warm. The newer advanced technology wood stoves, fireplaces and furnaces can function well with a wider variety of wood species because of their better control of the combustion process than older conventional stoves. The length of the pieces must be suitable for your stove, furnace or fireplace. Shorter pieces are easier to handle and preferable to pieces that are too long for the appliance. Pieces that are even slightly too long can make fire stoking difficult or impossible. For stoves and furnaces, pieces should be at least 3 inches shorter than the fire box size. Even if a stove firebox is big enough to take firewood as long as 20 inches, shorter pieces are usually more desirable for ease of handling and fire maintenance. Good quality firewood is a consistent length. Lengths varying more than 2 inches are a sign of poor quality and may cause problems in loading the appliance. 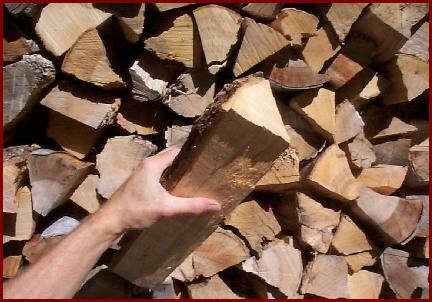 For convenient handling and stoking in most wood stoves, firewood is best cut into pieces 14 to 18 inches long. Small firewood pieces are often better than large pieces for convenient stoking. A range of piece sizes is best. Most commercial firewood is not split small enough for effective fire building and maintenance. Big firewood pieces tend to smoulder longer when placed in the fire, whereas smaller pieces ignite quickly. Small pieces are better for small fires in mild weather. Even in cold weather each load should be made up of a few small pieces that will ignite quickly and some larger pieces that will burn steadily for several hours. Ideally, the wood should be split to a variety of sizes ranging from 3 inches to 6 inches measured across the largest cross section. Expect to pay more for wood that is split smaller and into a variety of sizes. This firewood has been processed from prime, straight logs that would have been better used for durable products like flooring or furniture. Stack the wood in separate rows in an open location where the summer sun can warm it and breezes can carry away the moisture. Do not stack unseasoned wood tightly in an unvented storage area. Do not allow firewood to lie on the ground for more than a couple of days before stacking. Mould and rot can set in quickly. Stack the wood up off the ground on poles, lumber rails or pallets. The top of the pile can be covered to keep off rain, but do not cover the sides. Softer woods like pine, spruce and poplar/aspen that is cut, split and stacked properly in the early spring will be ready for burning in the fall. 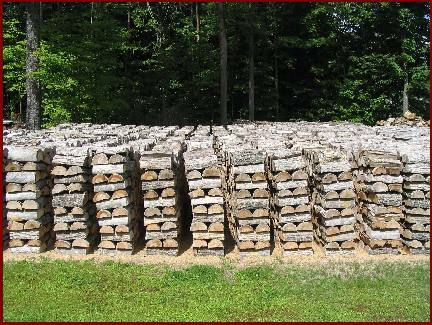 Extremely hard woods like oak and maple, and large pieces of firewood, may take at least a full year to dry enough. Drying may also take longer in damp maritime climates. There are a few ways to tell if wood is dry enough to burn efficiently. Use as many indicators as possible to judge the dryness of the firewood your are considering. Here is five ways to judge firewood moisture, presented in order of most to least effective. 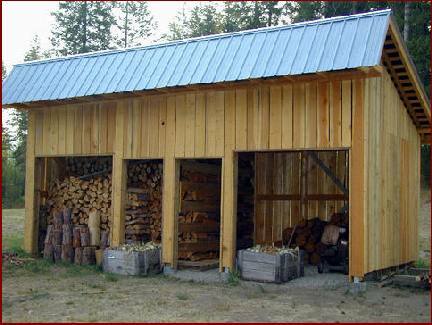 When the firewood has dried in the sun and summer breezes, move it to winter storage. The area should be dry and fully sheltered from rain and snow. Ideally, this area is close to, but not inside the house. Large amounts of wood should not be stored inside houses because of the risk of mould growth, which can contaminate the indoor air with spores. However, a small amount of wood stored inside can give it time to warm to room temperature before burning. Try to buy your wood from someone who uses good forest management practices. Environmentally sound woodlot management involves thinning out dying and damaged trees and less desirable species. To support sustainable forestry practices, use wood from a blend of species. Burn the softer woods, such as pine, poplar and aspen, in the spring and fall. These are the ways you can help to ensure that wood is a sustainable energy source for home heating. Why is there no standard price for firewood? Energy content: Very soft woods like poplar and spruce have about half the energy content per cord of very hardwoods like white oak or iron wood. Based on energy content, they should cost about half as much per cord. However, processing, transportation and storage costs are the same regardless of species, so while the price of softwoods may be lower, expect to pay considerably more than half the cost of hardwoods. Location: Because of shipping and storage costs, firewood sold in urban areas can cost at least double the purchase price in rural areas. 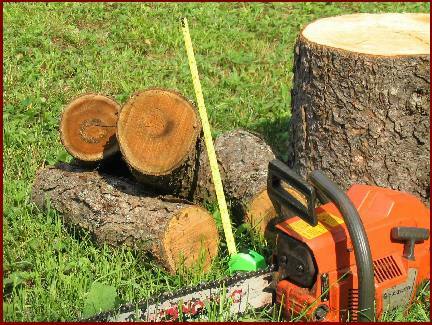 Dryness: Fully-seasoned firewood usually costs more than green, unseasoned wood because it has been stored for longer. Piece size: Firewood processed in shorter lengths and split smaller usually costs more because of the additional handling and labour involved. Amount purchased: A bag of firewood purchased at a convenience store will cost more per cord equivalent than the purchase of a full cord or more. Delivered or not: Delivered wood is more expensive than wood you load, transport and stack yourself, especially if it is stacked by the supplier. For all these reasons, firewood can range in price from less than $150 for the equivalent of a full cord to more than $300. Paying a little extra to get good quality seasoned firewood that is the right length and split properly is a good investment because of increased convenience and efficient burning. A version of this article was published by Natural Resources Canada in 2005. Created by Gulland Associates Inc.